This is a very solid feeling, compact rig that runs on 9.6 - 14.5 Volts DC and will be terrific for portable QRP operation drawing 500mA on receive. The receiver is quoted as being better than 0.45uV and the pre-amp seems to make a huge difference. Received audio is strong (the Elecraft KX3 could learn from this rig!) but bandwidth is fixed. Receive: 0.1 - 30MHz continuous. 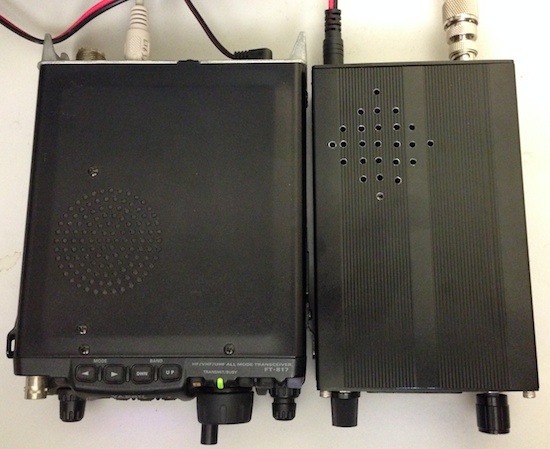 There is a DB9 serial connector on the back and the rig can be controlled as if it was an FT-817 (ah the irony). I'd love to see something like this with a USB cable for both control and audio - that would make a terrific digital modes transceiver. F1 and F5 increase or decrease the tuning rate while F2-F4 operate soft buttons which show on screen. I'll report back next weekend when I've had some contacts, but my feeling so far is that this is a pretty good little short wave radio that covers 0.1 - 30MHz continuous and as a bonus transmits too. The user manual pdf is here. Here's a contact with Mal, VK2BMS. Any comments yet on what this transceiver is like to use? CW operation has been corrected with new firmware update.